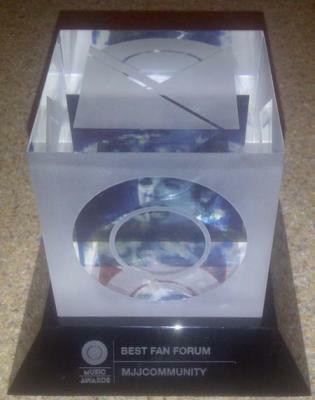 Michael and his fans took home first place as Winners of the 2011 O Music Awards, Best Fan Forum – congrats to MJJCommunity.com for winning in this category. The O Music Awards aren’t just about pimping out cool videos in HTML 5 or whatever and breathlessly watching Chiddy Bang rap until he potentially passes out (though those things are mega important too). It’s about honoring some of the biggest, most knowledgeable, and most devoted music fans online. The ones who live in fan forums, sharing photos and facts, turning online friends into IRL ones, and worshiping at the altar of the artists recognized by the O Music Award Fan Forum nominees: Animal Collective, Britney Spears, Justin Bieber, Kanye West, Michael Jackson and Phish. Beliebers, Brit Stans, Phish Heads, and Animaniacs (okay, so Animal Collective Fans probably don’t call themselves that) all rallied around their favorite artist and fan forum, but only one artist and fan forum rallied the hardest. That artist is Michael Jackson, and the fan forum that won the O Music Award is the MJJacksonCommunity.com.